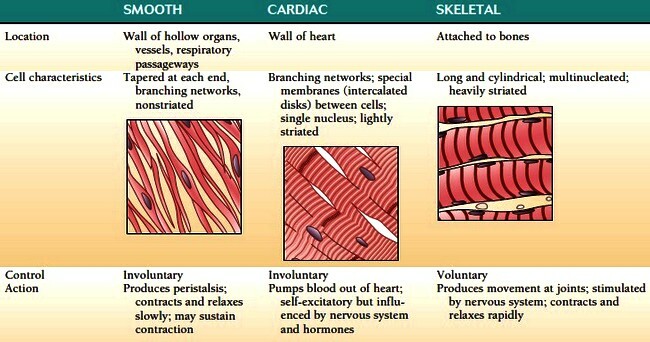 There are three kinds of muscle tissue: smooth, cardiac, and skeletal muscle. After a brief description of all three types (Table 4-1), this page concentrates on skeletal muscle, which has been studied the most. Smooth muscle makes up the walls of the hollow body organs as well as those of the blood vessels and respiratory passageways. It moves involuntarily and produces the wavelike motions of peristalsis that move substances through a system. Smooth muscle can also regulate the diameter of an opening, such as the central opening of blood vessels, or produce contractions of hollow organs, such as the uterus. Smooth muscle fibers (cells) are tapered at each end and have a single, central nucleus. The cells appear smooth under the microscope because they do not contain the visible bands, or striations, that are seen in the other types of muscle cells. Smooth muscle may contract in response to a nerve impulse, hormonal stimulation, stretching, and other stimuli. The muscle contracts and relaxes slowly and can remain contracted for a long time. Cardiac muscle, also involuntary, makes up the wall of the heart and creates the pulsing action of that organ. The cells of cardiac muscle are striated, like those of skeletal muscle. They differ in having one nucleus per cell and branching interconnections. The membranes between the cells are specialized to allow electrical impulses to travel rapidly through them, so that contractions can be better coordinated. These membranes appear as dark lines between the cells (see Table 4-1) and are called intercalated disks, because they are “inserted between” the cells. The electrical impulses that produce contractions of cardiac muscle are generated within the muscle itself but can be modified by nervous stimuli and hormones. When viewed under the microscope, skeletal muscle cells appear heavily striated. The arrangement of protein threads within the cell that produces these striations is described later. The cells are very long and cylindrical and have multiple nuclei per cell. During development, the nuclei of these cells divide repeatedly by mitosis without division of the cell contents, resulting in a large, multinucleated cell. Such cells can contract as a large unit when stimulated. The nervous system stimulates skeletal muscle to contract, and the tissue usually contracts and relaxes rapidly. Because it is under conscious control, skeletal muscle is described as voluntary. Skeletal muscle is so named because most of these muscles are attached to bones and produce movement at the joints. There are a few exceptions. The muscles of the abdominal wall, for example, are partly attached to other muscles, and the muscles of facial expression are attached to the skin. Skeletal muscles constitute the largest amount of the body’s muscle tissue, making up about 40% of the total body weight. This muscular system is composed of more than 600 individual skeletal muscles. Although each one is a distinct structure, muscles usually act in groups to execute body movements.